There is plenty of research to support the enormous wealth effect of rising home prices. As household wealth increases, at least on paper, consumers tend to spend more and access to credit simultaneously becomes more abundant. In the United States, for example, from 2002-2006 low credit-score homeowners borrowed an average of $0.40 for every $1 increase in home equity value. However, as Real Estate begins to slow, it isn’t long before the knock on effects leak into the overall economy. 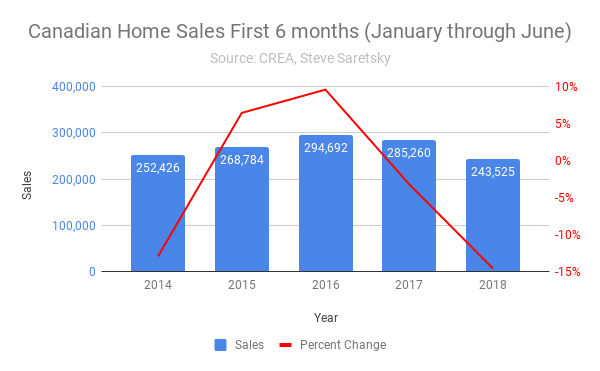 Per the Canadian Real Estate Association, home sales are down 14.6% through the first six months of this year. Canadian Home sales and percent change Y/Y through the first six months. Meanwhile, residential investment, which measures the amount of capital spent on major renovations, new homes in a period as well as transfer costs and commissions, has been slowing. As of Q1 2018, residential housing investment soaked up $36.42 billion worth of capital, up 1.36% compared to last year. The annual rate of growth, however, is at the slowest pace since 2013. Generally, the slowing of the housing market begins to show up in consumer durables first, aka less frequent big ticket items such as cars. In recent years Canadian car dealerships have been the benefactor of cheap credit. Dealerships have been pumping out new vehicle sales using incredibly lucrative 0% financing with lengthy loan terms, up to 72 month in many cases. This has ballooned auto sales, which have recorded five straight years of growth, including all time record sales in 2017. However, that streak looks to be coming to an end. According to the latest Canadian sales figures, the sales downturn that began in March has continued into July. 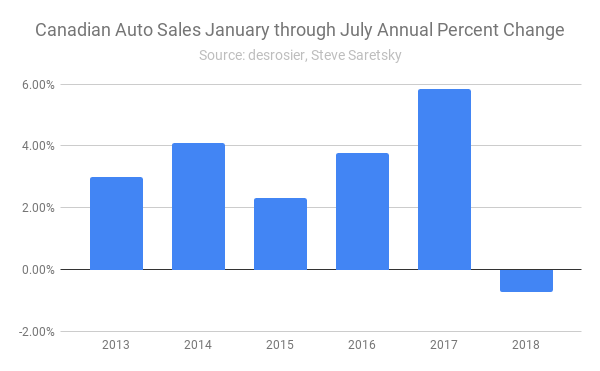 Year-over-year auto sales fell 3.6% in July. This pushed year to date sales into negative territory, down 0.7%. Despite the small decline, July 2018 remains the fourth largest July by volume on record. This same phenomenon is also playing out in Australia where the housing market has come to a sudden halt. Aussie car sales fell 7.8% in July versus the same month in 2017. The worst monthly performance since June 2011. Interestingly enough, A research paper by the Reserve Bank of Australia in 2015 found that a 1% increase in property prices tended to lift new car purchases by 0.5%, against a broader lift in overall consumption of only 0.25%.